Sakai Community DocumentationSakai 19 User Guide (English) PostEmWhat is the PostEm tool? Instructors can use the PostEm tool to upload and distribute a comma-delimited (CSV) spreadsheet to present individual feedback and/or grades to students. Instructors can upload as many feedback files as they want. Students only see their own individual feedback and/or grades. The PostEm tool provides a convenient mechanism to post comments and grades for those instructors that regularly use Excel spreadsheet files to calculate grades. You might also use it to post class attendance records from a spreadsheet file. The first column of the spreadsheet must contain the student usernames. The first row must contain column headings. Note: The PostEm tool does not interact with the Gradebook. To access this tool, select PostEm from the Tool Menu in your site. 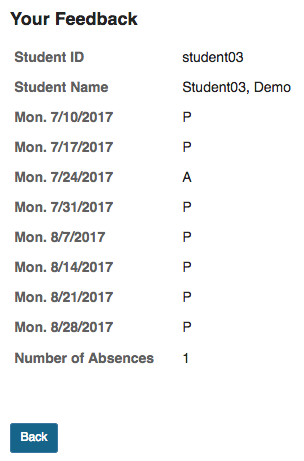 Example of Class Attendance feedback. 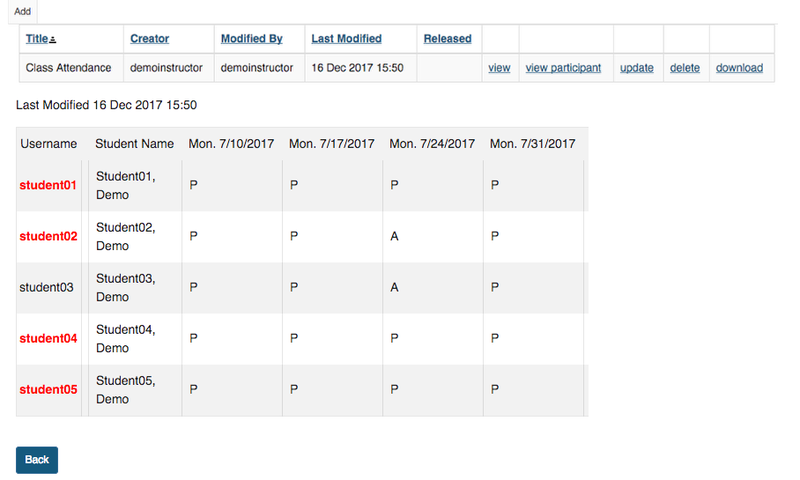 Zoom: Instructor view of class attandance feedback for all students showing a row for each student with attendance for each date. As the instructor you can see when a student has last checked their feedback. Any students who have never checked will appear in red. Prev: How do I remove a poll? Next: How do I add PostEm feedback?